The Illinois Department of Human Services (IDHS) funds the administration of the Illinois Youth Survey (IYS) biennially since 1990. 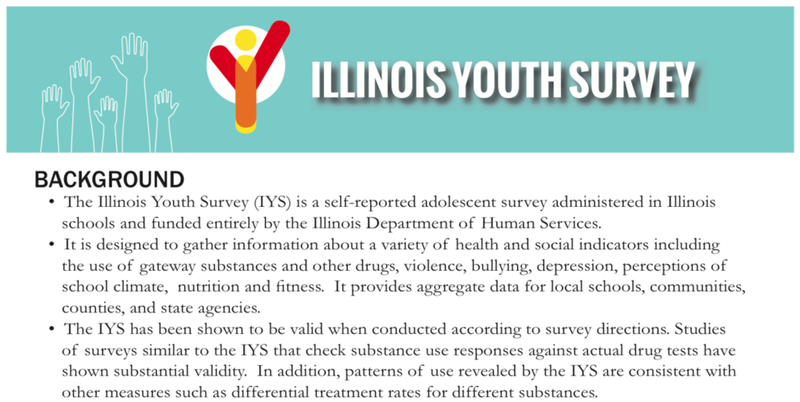 The IYS is a completely free self-reported survey administered in school settings and is designed to gather information about a variety of health and social indicators including substance use patterns and attitudes of Illinois youth in 8th, 10th and 12th grades. Add-on questions include data about LGBTQ+ youth in school. The 2018 Illinois Youth Survey is available to schools across Illinois at no cost. Registration is available online now and the survey can be administered any time between January and May 15th. For more information click the link below!